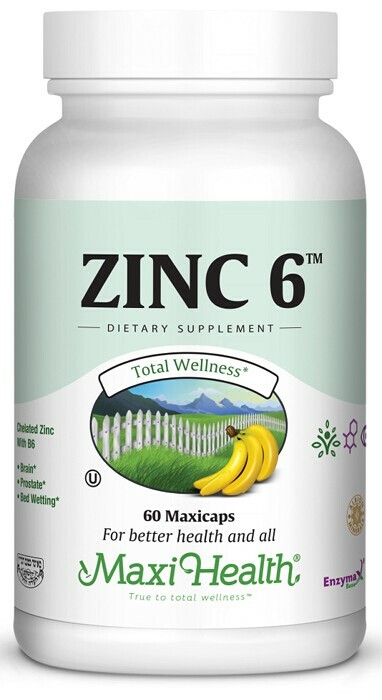 Maxi Health's Zinc 6™ lets helps you get both zinc and vitamin B-6 in one vegetarian capsule. Zinc is needed to repair wounds, support fertility in adults and growth in children, synthesize protein, help cells reproduce, preserve vision, boost immunity, support the healthy function and maintenance of the skin and protects against free radicals, among other functions. We use chelated zinc from TRAACS® known for is availability. Vitamin B6 supports the processing of amino acids (the building blocks of protein and various hormones). It supports conversion of glycogen to glucose. It also support appropriate homocysteine levels for cardio health. Take one (1) Maxicap™ twice daily, or as directed. sweeteners, flavors, colors, or preservatives. Chelazome® is a registered trademark of Albion Laboratories, INC. “The Mineral People”.